In 2013 Callaway added their Hyper Speed Face Cup, used in the company's drivers, to their X Hot fairway woods. The results were impressive and popular. So for the 2014 season, they are adding that face technology and distance to their new X2 Hot hybrid. For a while now the goal of hybrid design was to produce a club that offered more forgiveness and height than a long iron whilst bridging the distance gaps between a player's fairway woods and irons. With X2 Hot, Callaway wanted to add some distance whilst creating a better looking utility club. Featuring the new grey, orange and white X2 Hot colour scheme, the head design has been altered based on feedback from some of Callaway's Tour players. They have gone for a more contemporary head shape with a very different looking clubface. The profile of the club at address is now simpler and more iron-like than before with a straighter leading edge, and less offset. The X2 Hot hybrid also sits flatter on the ground which Callaway say will improve the way it looks and interacts with the turf. The X2 Hot is the first Callaway hybrid to feature a forged Hyper Speed Face Cup and Internal Standing Wave. Both technologies work together to provide a performance that is longer and more consistent. As you can see from the photo below, the face has changed a lot in a year compared to the original Callaway X Hot hybrid. The new face is larger with a more pronounced toe height. Perhaps more importantly it is thinner, 28% thinner in fact. By making the face thinner and lighter, Callaway say they made the sweet spot 13 times larger. Yes, 13 times. By increasing the effective size of the sweet spot, Callaway have added yards. 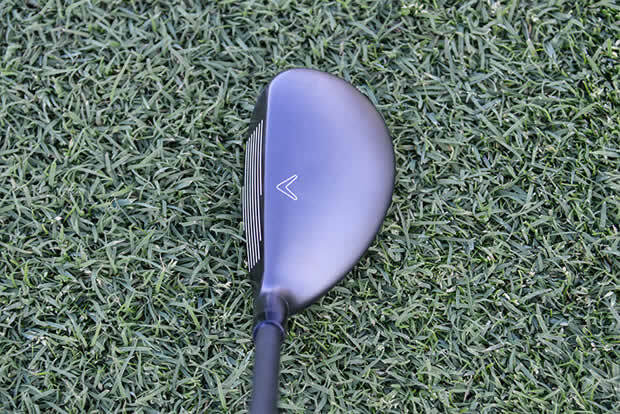 The Characteristic Time or "springiness" of the face has increased by 22% in the centre and 30-40% percent off-centre, which adds up to a hybrid that is averaging more than 10 yards further than the original X Hot. The standard X2 Hot hybrid is available in 4 different lofts and comes fitted with a low-torque Aldila Tour Blue shaft that promotes a higher launch with less spin.